Metallic – what can I say? I’m obsessed with Metallics especially in Purple! But this is such a Girls Night Out dress which unfortunately I do not have time to hang out with my girls that often. I decided to showcase how my experimenting turned out. This is the body hugging dress. I think it fits me really well without discomfort. However there is that tummy issue that no matter how much exercise and dieting I do, will not go away completely. This is my favorite style. Very simple with a wild leopard cardigan. I could wear this to work – granted the length of this dress will make me really self conscious. I might have to tights to this outfit to really pull it off at work. High Tea anyone? Or even a meeting at an upscale restaurant? I do believe that the ultimate lady like piece is the tweed jacket. I am enamored with this particular jacket. It’s cropped length easily layers on top of the cardigan. The different textures and lengths all combines into a pretty stylish outfit. Without the cardigan, the tweed stands alone and can hold outfit together. 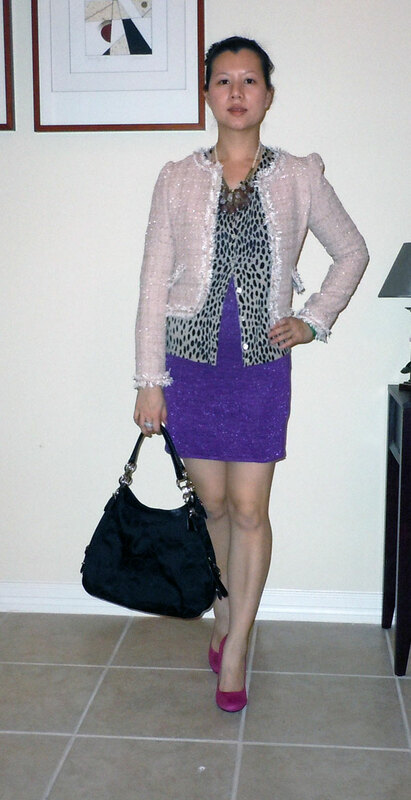 I just think the outfit is too sparkly – the tweed has strands of glittered frays and the dress is metallic. This could be a Date Night outfit with my husband. I really like that this dress could work in 4 different styles.